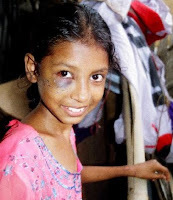 Bangladesh faced a terrible tragedy on 11th June 2007. Indiscriminate hill cutting during the last three decades has led to the disappearance of over one hundred hills and partial destruction of hundreds others in Chittagong city, causing environmental hazards and raising the incidence of landslide, experts said. Landslides in last few days killed more than 100 people in the port city, raising such death toll during the last three decades to over 200. Arild Klokkerhaug is an entrepreneur, blogger and the man behind the largest Bangla blogging platform "Bandh Bhanger Awaaj". During this disaster he led from the front to show how the blog community could mobilize in a tragic situation like this. 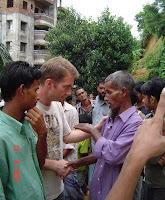 Arild and some other bloggers went to Chittagong and reported about the situation. Bangladeshi Bloggers, students from all over the world started raising funds for the victims. I am also a contributor in somewherein blog community and was involved in raising fund online immediately after the tragedy. Generally what follows after such tragedy is that the focus only given for some very brief period. After initial few days government officials' visit, quick reliefs distribution, flashes of photo journalists camera, everybody seems to forget it. Even the emergency relief agency come and support for a very short time. After few days or weeks, the victims are left alone and we tend to forget easily. the media become busy with other stories. But the hard fact remain is that those utterly poor people are in exactly the same situation or even worse. There remains many in the hospital in critical condition needing medium or longterm medical care. They have no money, some lost all of their immediate family members and last refuge of support. So from somewherein blog community, Arild and others have reached out to the victims; very importantly they have identified real people that need help to rebuild their lives, people that now only see darkness ... and assured them that we will be beside them for the coming three months, until they can move on with their life in normal rhythm again. Thats where this appeal for donation comes in.